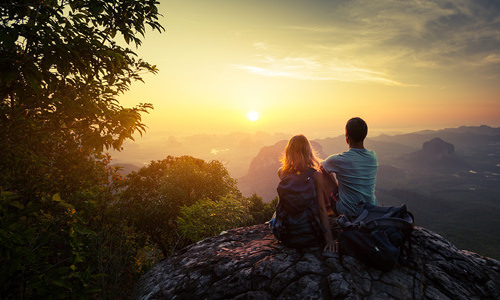 So whether you’re traveling for business in Mexico City, taking a break from studying near Machu Picchu, or camping in the Colorado Rockies, here is our advice for travelers looking to stay healthy in high altitude destinations. 1) Learn about your destination—believe it or not, you don’t have to climb to the top of Mount Everest or ski the highest mountain in the Swiss Alps to experience altitude sickness. In fact, many people plan trips to high altitude destinations and may not even know it. An easy way to check the elevation of your destination is to use a site like veloroutes.org. Simply type your desired location into the search box, click “find elevation” and the elevation of that location will appear on your screen. A general rule of thumb is the closer you live to sea level, the harder of a time you’ll have when visiting higher altitudes—also, be particularly cautious if you’ve experienced symptoms of altitude sickness before. 2) Go to the doctor—after you’ve done your research and you decide you could be at risk for altitude sickness, book an appointment with your doctor or travel medicine specialist. If feasible, they may recommend acetazolamide, often marketed under the brand name Diamox, which is the most tried and tested drug for altitude sickness prevention and treatment. Depending on your risk factors, some doctors might advise you to pack ibuprofen (effective for relieving altitude-induced headaches) and ginger chews, capsules or tea, which can help quell altitude-induced stomach nausea. 3) Acclimate slowly—getting acclimated to higher elevations than you’re used to can take anywhere from 1-3 days at a given altitude. At the beginning of your trip, consider spending a night or two at an “intermediate” altitude before going higher—for example, instead of flying straight from Orlando to the Rocky Mountains, plan on spending a day or two in say, Denver first. Also, take it easy for the first 24-48 hours of your trip and plan quieter activities before going all out with higher-intensity endeavors. This is easier said than done, but will help avoid headaches (literally) from creeping up on your trip. And don’t forget—even everyday activities (like shopping!) at higher altitudes can feel more difficult at first, so take it easy and rest whenever you need it. 4) Watch What You Eat…and Drink—when all is said and done, complex carbohydrates allow you to use oxygen more efficiently and help maintain your energy levels—both important factors in preventing altitude sickness. So leave your Atkins Diet book at home, and plan on eating plenty of complex carbohydrates including whole grains, fruits, vegetables and legumes. And remember, at high altitudes you want to add water to your body, not deplete it. Avoid caffeine and alcohol—especially while you’re still acclimating—and drink at least 8 glasses of water a day (even more if you’re active). Symptoms of altitude sickness can surface with even the healthiest athletes and are NOT a sign of weakness! The good news is, most altitude-induced symptoms are mild and can be avoided—or treated—by following the tips described above. However, in the unlikely event these above symptoms become unbearable, it’s important to know who you can call in the event of a medical emergency. Good Sam TravelAssist members can rest assured that no matter where they are traveling, we can help get them into the hands of appropriate medical care whenever they need it.